How ‘Schedule Post’ option works? How ‘Repeat Post’ option works? 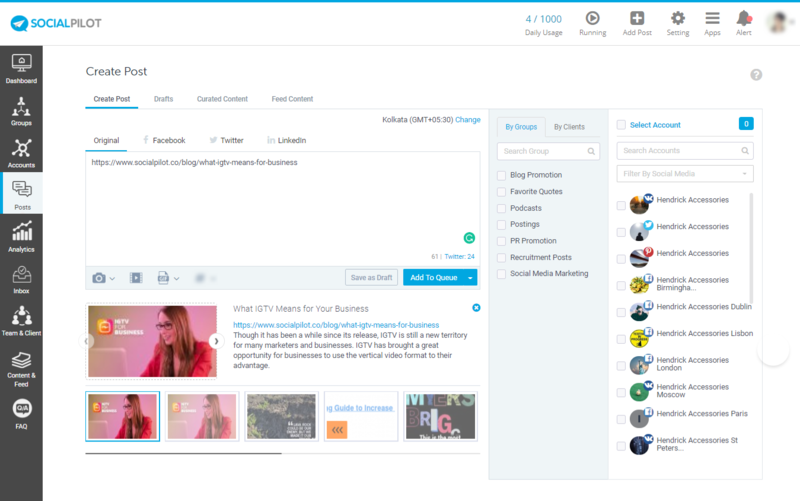 In SocialPilot, you can create a post using various elements like text, links, images, videos, and GIFs. To create a post, you need to connect your social media account(s) from the Connect Account page. Click on 'Posts' -> Create Post from the sidebar menu. Type in the text in the provided box. Click on the Camera icon and choose an image from your desktop. Alternatively, you can choose an image from the site/blog link you pasted in the text box. You can also upload images from your Dropbox. Note: If you have entered the URL of a blog/site in the text box, you'll see a preview of all the images from that page. You can upload a maximum of 4 images to go along with one post on Facebook, Twitter, VK and Tumblr. Note: If you want to change the image only from the link preview generated, hover over the image and you’ll see a camera icon with a plus symbol on it. Click on it and you’ll be able to upload your own image. This applies to text/link posts for LinkedIn only. For Facebook, Twitter and other social media platforms, the post will be shared according to the o.g. meta tag set on the URL you use in the post. Click on the Video icon and select a video from your computer. Note: The 'Video Title' and 'Content Category' boxes will be available for Facebook posts only. Click on the GIF icon and type in a keyword to search for a GIF. Click on the GIF of your choice. 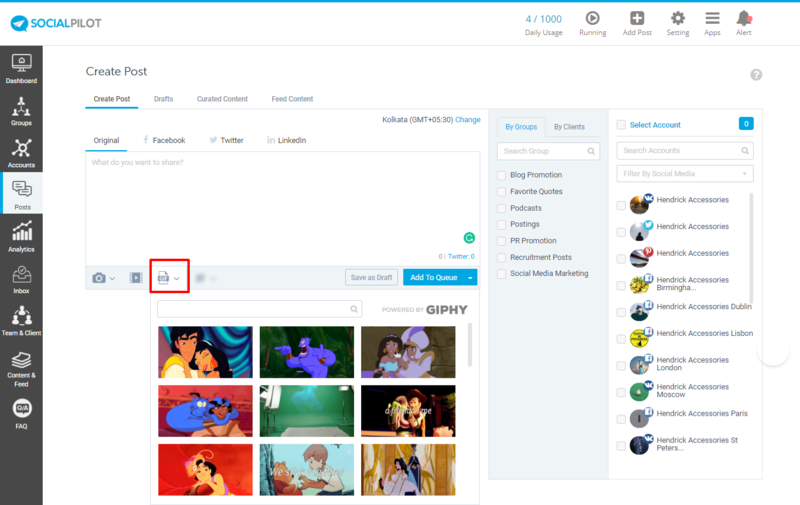 Note: SocialPilot allows you to select either 4 images or a GIF or a video. You cannot select images, video, and GIF together. Select account(s) from which you want to publish the post. Note: You will be allowed to schedule tweets to one Twitter account only (at a time). You can create the post again and select another Twitter account. Twitter introduced new guidelines disallowing all third-party apps like SocialPilot to permit users to share the same post to multiple Twitter accounts at the same time. The new guidelines aim to “prevent people from exploiting several accounts for artificially amplifying a message”. You can learn more about guidelines here. Click on ' Add to Queue' to schedule your post according to your defined time slots. Click on ' Share Now' option to publish the post immediately. Click on ' Share Next' option to share this post after the first post in your queue for the selected account(s). Click on ' Schedule Post' option to schedule your post for a specific date & time (other than your defined time slots). Click on ' Repeat Post' to repeat this post for the selected account(s) for a number of times over a particular time period. Note: SocialPilot allows you to tag Twitter accounts in your posts by including their handles in your posts, for example, @username. 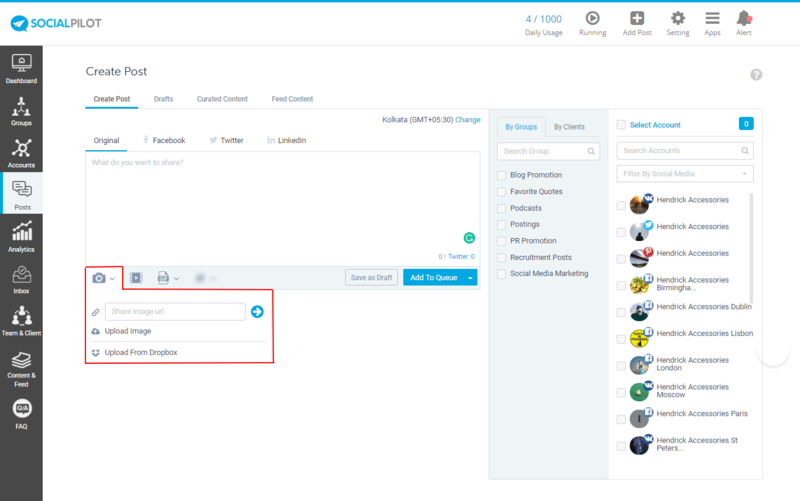 SocialPilot will automatically convert them to 'mentions' when they are published from your Twitter account(s). Creating posts couldn't get any easier! Let's have a look at how you can use these scheduling options. Note: Currently, you don't get an option to include an emoji in your post. However, you can copy and paste an emoji in the 'create post' box and the post will get published with the emoji. How does 'Add to Queue' option work for automatic scheduling? You can assign multiple time slots for each day for each account. Refer to the image below. As per the image, 14 posts are in queue - the first post will be published on Friday at 1:00 p.m; the 2nd post will be published at 10:00 p.m; the 3rd post will be published on Saturday at 3:30 p.m. If there are no posts in the queue after that, the slots in the schedule will remain unused. How does the 'Schedule Post' option work? How does the 'Repeat Post' option work? On clicking on the 'Repeat Post' option from the 'Add to Queue' drop down, a pop-up will appear where you need select how many times do you want your post to be repeated and in how many days.Click on the 'Preview' button to view and edit the date and time of your repeated posts. 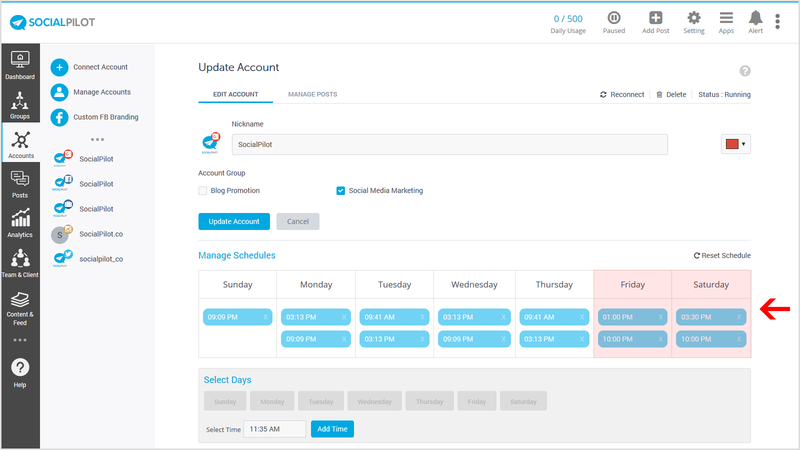 As you click on the 'Preview' button, SocialPilot will calculate the days and time accordingly and show you a schedule. You can customize these dates and times according to your preferences. Click on the 'Schedule' button to share these repeated posts from your account(s).